So the Ciro Trail. I’d read a few pieces by newspaper journalists talking of a “new tourist route” and “open air museum”, which all sound intriguing but what is it really like? Can I use a road bike? Are there any facilities? And most importantly what about the landmines? In the UK most disused railway lines are absolutely packed with families on the weekend, as they set out for a picnic and a pedal on traffic free routes. Don’t expect this to be anything like that! 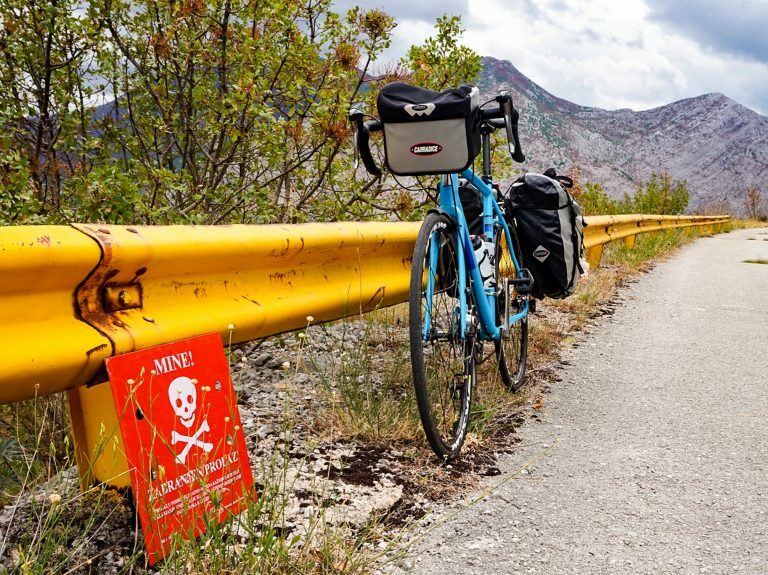 I cycled the full length of the Ciro Trail from Dubrovnik to Mostar in mid-September and I didn’t see a single other person cycling it. So when they say tourist route that does not mean that it’s packed with tourists, only that tourists might be interested in seeing it. It is definitely interesting, but I would not describe it as a “major tourist attraction” like the cities at each end of it. You have to ask who wants to cycle through landmines, abandoned villages and crumbling railway stations. Railway enthusiasts? People interested in war history? I guess the majority will be people on a cycle tour wanting an interesting alternative to the busy main roads which is the reason I chose to explore it. Don’t stray off the tarmac in some areas! The route is tarmacked for the majority of it, but not for the tourists. This old railway line is the only road in and out of some of the communities out there. So expect the occasional car to need to pass. You’re not going to want the car to force you off the road or pass too close because when you see just how close to the tarmac the landmines are buried it makes you a little bit nervous and paranoid about just how stable you really are. There aren’t landmines everywhere, but I found that the signage was not extensive, so the best advice would be to assume they are everywhere. I read a few bits about beating the ground with a long branch to check for them, but really there are no long branches out there in the scrubland, certainly not any accessible from the safety of the tarmac. The distance is about 90 miles from Dubrovnik to Mostar, and the majority of that is flat, with only one real change in altitude right in the middle. For me that is a single day, for others that may be a few days so it’s important to know what’s out there. There is a nice hotel, bar and restaurant about 30 miles from Dubrovnik (in Zavala) and there is absolutely nothing in the way of facilities before that. A few villages where only a couple of houses are still inhabited surrounded by some ruined buildings. It’s quite an experience, quite moving, I definitely felt quite alone out there I the scrubland. It’s quite beautiful in places. A quite bit of tarmac, the mountains and some nice weather it’s a very pleasant place to roll through taking it all in. After a bit of light refreshment in Zavala the route splits, a short off road section that is flat, or a road section over a small hill. I took the off road section on my skinny 28mm tyres. It was not the fast option but it was more of an adventure. The gravel track passes through the houses of a village and heads into a long tunnel. I stopped to fix my front light to my handlebar bag before heading in. Pitch black and off road do not mix well. I cycled into the darkness. About half way through the ground became very soft and I sank deep into it, my pedals becoming covered in the dirt and nearly loosing my balance. Then it seemed like my bike began squeaking, but the noise was not stopping when I stopped pedalling? Strange. Then something flew across my line of sight. Bats! That was bat poo that nearly made me crash! I emerged into the light to see a rusty and broken bridge with a nicely restored and safe looking bit to cycle across. This is great! Slow going on the gravel but really interesting compared to everything before it. I stop to pick up an empty bullet shell lying on the track, from the war I hope. I get back onto the tarmac and carry on. The track follows the side of a hill, elevated above the valley floor so the views are pretty good. The recent fires from earlier this summer have destroyed huge patches of hillside. One section has stripped all of the leaves from scrubland overgrowing a deserted village; exposing all of the ruined buildings and stone pathways from this stone built village. I pass a single sign just laying on the ground marking another minefield. Not very well marked in my opinion! The route splits again into the longest offroad section, but a thunderstorm hits and it’s some serious rain. I opt for the tarmac option with my skinny tyres in this weather but I think this off road section would have been the most interesting bit of the route. Instead I take the rapidly flooding roads over some climbs and down a hairpin descent to the lake; Donje Blato. From here, apart from a few old railway bridges and buildings all of the unique parts of the route are pretty much over. It’s all normal and habited. There are towns and it becomes more developed as you head towards Mostar. 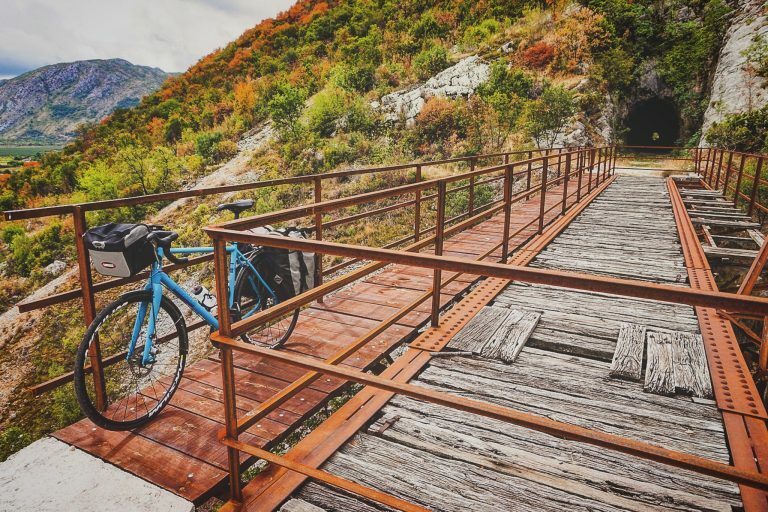 The Ciro Trail follows by the side of a railway line and river, with some parts being smooth gravel tracks for short sections before becoming an industrial area on the outskirts of Mostar. The hotel in Zavala offers rooms and bike hire so would be the best place to explore from. If like me you want to use this as part of a cycle touring route I have heard that the hotel/café in Zavala have in the past let people camp out the back, you may want to check this if you intend to try it. I certainly would not recommend wild camping in this region. Otherwise some deviation from the trail to towns off the side of the route might be required to get food and shelter. Overall I definitely preferred it to cycling on the main roads, a refreshing change on a multi-day tour. It’s very remote in places with limited options for getting food and water, but there are a few along the way. It was quiet, thought provoking and even beautiful in places. I wouldn’t say it’s a must see tourist destination, but if you’re cycling though this area it offers something very different to just sticking to the roads. A very quiet route through the mine fields and crumbling remains of the Austro-Hungarian railway, between two very prominent tourist destinations. I cycled out of Dubrovnik on the busy main road heading south, then took the first left up a narrow road over the top and past the dog kennels. Carry straight on over a roundabout and keep heading uphill to the boarder. Once you’ve crossed the boarder (there are two, one to leave Croatia, and a second crossing to get into Bosnia Herzegovina) and have crossed into Bosnia take the immediate left just meters after the boarder crossing. There are no signs to show you this. You will only see your first “Ciro Trail” sign when you’re heading down the road in Ivanica. When you get to Hum you need to follow the main route around the old station building to the left, not past the old church to the dead-end near the farm! I drew out a basic route following the R426 road on my GPS as the route is not perfectly signposted so offered reassurance in places where the signage was lacking. If you’re looking to rent a bike to do this I recommend using the bimbimbikes website to arrange your bike rental before you arrive. Check them out, it’s like booking.com but for bikes. My planned route was this, it’s not 100% correct but it’s pretty close so a good guide for anyone planning this cycle. Baerbel Gerhardt – We did this back in July and really loved it. We also cycled the longer gravel part with the many tunnels. Would have been very painful on your bike as we had to push often as gravel got very deep and hard to ride. But the views were worth it, we really loved it. And the climbs are really easy. In my opinion wild camping is possible on this unpaved stretch as you could just pitch your tent next to the road and picnic tables – there is no traffic at all as the bridges are too narrow for cars. Manuel Manuel We have cycled half of it this summer. On our tandem. Agree on most of your impressions. There is a hotel in Ravno, and is called Stanica Ravno. Is an old station. There is also a bar and a shop in Ravno up in the village. Also in Hutovo we found one small shop selling drinks and food. We did the off-road part you skipped, it was definitely the hardest part. There are about 10 tunnels full of bats, and I think 2 or 2 such bridges, all with a nice signal cross at your own risk. I found the surface of the trail to be the hardest thing I missed some suspension even if I had 45 tyres. You can have a look at our page Withthisbicycle we have some photos of the off-road part you skipped. Thanks for the details. 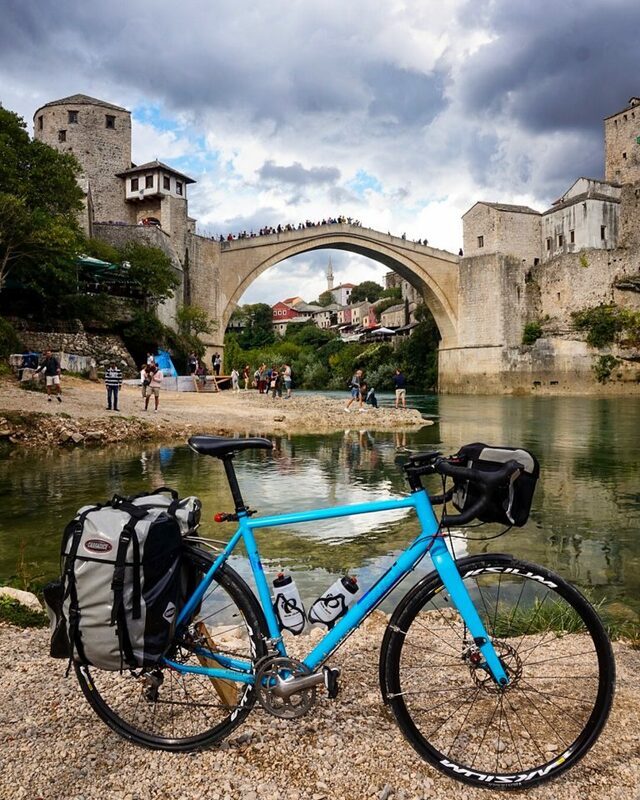 Planning to do this ride in September 2019, from Mostar down to Dubrovnik.